Preparing for a new baby is exciting, daunting and overwhelming. While many expectant parents are busy setting up the nursery, going for birthing classes and buying stuff, pet owners have the extra responsibility of getting their fur babies ready to welcome the new addition. It is important not to leave these things to chance as many pets can get stressed out with the potential change in routine, the probable decrease in attention from their owners, not to mention a new loud and unpredictable infant that will join the family. Preparation is key to preventing your dog showing aggressive or anxious behaviours towards your child. Obedience training : How well does Fido respond to basic obedience commands like ‘sit’ ‘stay’ and ‘leave’? If you have not already done so, sign him up for obedience classes or for a refresher course if it’s been awhile. It makes a huge difference to be able to reliably have your dog sit and wait while you are tending to your baby. You may prefer to have your dog lie down on a mat close by while you are holding the baby and only come when allowed to. These commands take a few weeks to a few months to introduce and reinforce but they are well worth it. Enforce the rules: Does your dog normally greet you by jumping up and licking your face? Does your dog normally sleep in your bed or beg at the dinner table? If you do not want him to do so when the baby arrives, it is a good idea to get him used to the new household rules. Practice each night by ignoring your dog if he jumps up when you walk in through the door. Give him no eye, verbal or physical contact until he settles down. Wait for him to stop jumping or get him to sit before giving any attention. Give treats initially to reinforce this behaviour faster. Get your dog a nice pet bed that he can sleep in in another room or on the floor and start to teach him that his not allowed on the bed anymore with the off command. Old habits die hard, so it is important to start teaching these new rules early. Prepare him for a new routine: If you walk your dog twice a day and feed him at the same time each day, it might be worth changing things up to get him used to a less predictable routine. Feed your dog a bit later on some mornings and reduce the frequency of his walks. If you have a high energy dog that requires plenty of exercise consider getting a dog walker before your baby arrives to get him used to the new person. Baby Simulations: Once you have some obedience commands under your belt it may be worth while testing things out by playing some baby crying noises and carrying a baby doll to see how your dog reacts and to practice reinforcing those sit stay commands. Practice grabbing your dog on the skin, tail, paws and ears (gently first) to make sure that he doesn’t react by biting. Ensure you reward your pet consistently for good behaviour (ie not reacting when you grab his tail) especially when you first start. When the baby comes home, get some one else to hold your baby while you greet your dog. Try as much as possible to create positive experiences for your dog when he is around the baby such as feeding him while you feed the baby or giving him a chewing toy for him to gnaw on while he is in the same room as your baby. Allow him when he is calm to sniff and investigate your new addition, keep him on a lead if you need to. Take him for walks with your baby in the pram and he will slowly foster a positive connection with your child. 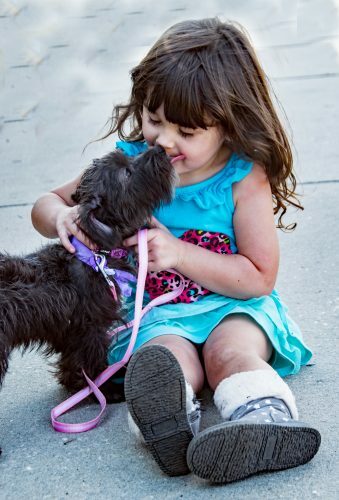 Preparing your furry friend to meet your baby is the first step to creating a good relationship between dog and child. If you would like more information on the subject, a good resource that comes complete with baby sounds is a book by Dr. Lewis Kirkham, “Tell Your Dog You’re Pregnant”. Alternatively, if you have problems or questions unique to your situation, contact your veterinarian. Let us know in the comments how you prepared your dog for the arrival of your baby!